In the early days of the Iraq War, the director of the Secret Service was summoned to the White House Situation Room for a meeting with Joe Hagin, then serving as President George W. Bush's operations chief. Bush, Hagin told him, wanted to spend Thanksgiving in Baghdad with the troops he'd sent to war eight months earlier. "Bad idea," the director, W. Ralph Basham, recalled telling Hagin. But Hagin was undeterred, Basham said, and offered a swift retort. "The President's going to go to Baghdad," Hagin said. "We can either go with him or we can meet him when he comes back." The approach was characteristic for a man who has planned presidential trips and catered to the whims and demands of every Republican president since Ronald Reagan. Now, back in his role as deputy chief of staff, Hagin is being counted on to pull off a high-stakes presidential trip of a different nature, President Donald Trump's summit with North Korean leader Kim Jong Un -- and with its hastened timeline, it could be the highest-profile gambit of his career. Deployed to Singapore last week to negotiate logistical details with a delegation of North Koreans, Hagin has assumed an outsized role in the preparations for the off-again, on-again meeting. His advance work in the Southeast Asian city-state could determine whether the summit happens at all. From the start, logistical concerns have assumed a major role in the meeting's planning, from determining its location to assuaging North Korean concerns about Kim's ability to travel safely from his hermit kingdom. Senior White House officials said his weeklong discussions with North Korean officials in the Southeast Asian city-state played a key role in giving Trump the confidence Friday to declare: "We'll be meeting on June 12 in Singapore." Hagin had finalized most of the logistical details for the summit, having earlier in the day held the last of his four meetings with his North Korean counterparts last week, a senior White House official said. Hagin's former colleagues say if anyone can cobble together a summit with a North Korean dictator in a matter of weeks, it's him. "Of all the people on the face of the earth who could pull this together, this guy Joe Hagin is the best," said Basham, who founded the consulting firm Command Ground with Hagin after both left government. "Joe has always been there. He's one of these people that you know what, if it's going to work, Joe Hagin is the guy that's going to make it work." With the white-shingled Capella hotel on the upscale Sentosa Island as their base, Hagin and a team of White House officials scouted ballrooms, hotels and government buildings over the last week as possible venues for the historic summit, all while hashing out logistical sticking points with their North Korean counterparts. The work was supposed to have taken place more than two weeks ago, but Hagin and his team were stood up by the North Korean delegation, dimming prospects the summit would take place. The next week, Trump canceled the summit in a letter, but it wasn't scuttled for long. Almost immediately, communication resumed between Washington and Pyongyang. And Hagin was dispatched again to Singapore. "Normally this kind of thing, you would have months to set it up," said Josh Bolten, Bush's former chief of staff who has known Hagin for more than two decades. "So it can't be as smooth as you would like, but Joe's presence gives me a lot of confidence." The agenda was stacked as Hagin negotiated with his North Korean counterparts. People familiar with the negotiations said the number of security guards who will be allowed in the room with Kim has been a chief worry for the North Korean leader, who has also expressed concerns of being deposed if he travels too far outside of North Korea, or remains gone for long. Other matters include how Kim will travel to Singapore on one of his country's aging Soviet-era planes, ensuring he has enough fuel to return to Pyongyang and, of course, how the summit will play for the cameras. For planning meetings, the discussions were mobbed by an unusual level of media interest and Hagin, used to carrying out his work behind the scenes, was often faced with a dozen reporters and photojournalists within minutes of leaving his hotel room, a senior White House official said. On more than one occasion, the negotiators made last-minute changes to the locations of their meetings to stay out of view of the media. The White House, in contrast, has given Hagin wide leeway to determine the best options for holding the summit, including its location. That long leash on an issue of paramount importance to the President is emblematic of the broad portfolio and power Hagin has quietly amassed inside the West Wing. As deputy chief of staff for operations, Hagin oversees nearly every aspect of the White House's logistical and personnel operations, with oversight over everything from the White House's advance office to its human resources office and office of personnel security, which doles out security clearance recommendations for current and incoming staff. And he has been involved in the administration's most sensitive foreign policy issues, namely traveling with Secretary of State Mike Pompeo in early May to secure the release of three American hostages. His presence at the most senior levels of the Trump White House has comforted some of his former colleagues and even Democrats who worried about the fate of the country in the wake of Trump's election. Meeting with the incoming chief of staff Reince Priebus during the presidential transition, Bolten, the former Bush chief of staff, said he "underscored for them the importance of getting a Joe Hagin -- and somehow they got Joe Hagin." "I think we're all the beneficiaries of it," Bolten said. "As turbulent as this White House often appears, without Joe Hagin there I think it would be considerably more turbulent." That view is one that Hagin appears to share, according to three current and former White House officials who requested anonymity to speak more candidly. 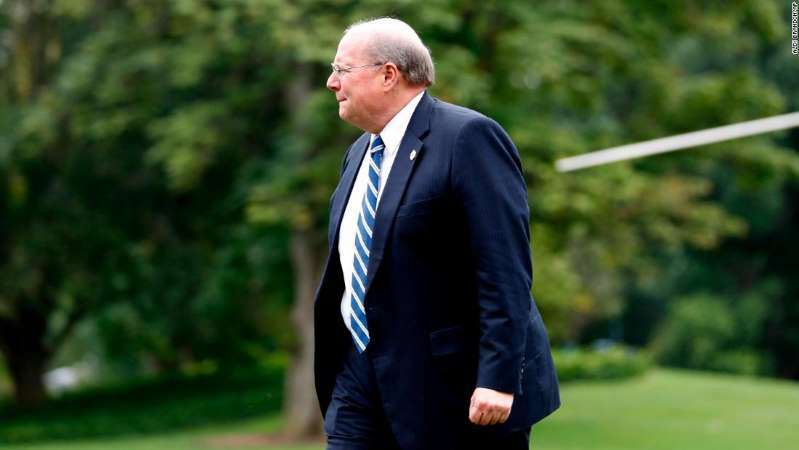 "He is known for having an air of he's going to kind of save the country from the President," one White House official said, adding that Hagin has repeatedly demonstrated a disdain for the President's unconventional style and use of Twitter. Two officials said Hagin has kept sensitive logistical details from Trump -- including during Chinese President Xi Jinping's visit to Mar-a-Lago last year -- for fear that the President might tweet about them and upend the plans. Hagin frequently draws on one example in particular, reminding officials that during the transition, Boeing executives told the transition team that they were willing to renegotiate the cost of building a new Air Force One fleet, but asked that the President-elect and his team keep the plans under wraps. The transition officials told Trump, who soon tweeted: "Boeing is building a brand new 747 Air Force One for future presidents, but costs are out of control, more than $4 billion. Cancel order!" Two weeks later, the Boeing CEO said the company would get the planes built for less than planned. "Remember Boeing," Hagin now tells colleagues. White House press secretary Sarah Sanders said she had never heard Hagin make those comments and rejected allegations that Hagin keeps sensitive information from Trump, saying, "it's just not how Joe Hagin operates." "I've worked very closely with Joe and it's just not how his mind thinks or the way that he operates," Sanders said. Three current and former White House officials also said Hagin openly laments the atypical nature of Trump's presidency and its chaotic nature with another familiar refrain: "This would never happen in the Bush administration" -- a comment the sources said is often accompanied by an eye roll. Sanders did not dispute that Hagin has made the comment, but noted that while Hagin served throughout the Bush administration, his freshest recollection of that White House is "after they had been there for eight years." "You're going to go back to your most recent recollection," she said. "At the same time, I think it's fair to say that there are plenty of things that have happened that you would say wouldn't have happened in a Bush administration, but I don't think that's necessarily a negative. This is one of the reasons Trump was elected, to do things differently and to change Washington." Barry Bennett, a close Hagin friend and former Trump campaign adviser, said Hagin "loves the President" and said Trump has benefited from Hagin's decades of experience. "He is walking institutional knowledge. He knows where the pitfalls are before anybody else even thinks about them," Bennett said. Hagin, whose middle name is Whitehouse, has served in every Republican administration since Ronald Reagan -- decades during which he worked on nearly every aspect of presidential logistics, organizing global summits, foreign trips and secretive warzone ventures. Among those, Hagin -- then the White House scheduler -- helped organize the historic 1989 Malta summit between President George H.W. Bush and Mikhail Gorbachev, the Soviet Union's general secretary. Not unlike today, White House aides then hailed the meeting as a potentially earth-shaking moment that could reshape the current world order. From that historic summit to the planning for Trump's North Korea summit, Hagin has maintained a low profile -- the sign of what Bennett called "a quintessential staffer." "He would hate the fact that you're writing a profile on him. And he won't participate," Bennett said. Indeed, Hagin declined to comment for this story. But as some of Trump's aides fret that he has been overly eager to hold the summit with North Korean leader Kim Jong Un and with one senior White House official warning from the White House podium last month that it would be extremely challenging to pull of the summit by June 12, will Hagin be willing to push back on the President's zeal if needed? One former senior Bush White House official said that while Hagin always sought to accommodate Bush's demands, he was also willing to "speak truth to power." "He did get crossfires with the President on occasion," said the official, who could not speak on the record due to a contractual obligation with another TV network. A trained firefighter, Hagin repeatedly urged Bush and his aides against traveling to disaster zones in the immediacy of hurricane or other natural disaster, stressing that while it would assuage public demands for the President's presence, it would also drain emergency responders' resources. "Joe would say, 'We can't go now, I would really strongly recommend against it,' " the official said.